Honeywell announced today a new range of extremely strong yet lightweight cut resistant gloves for workers in the automotive, maintenance, logistics, utilities and the paper and glass recycling industry. Its new Vertigo Check & Go gloves combine high-performance-polythene (HPPE) fibre with a highly visible numbers system to deliver best performance safety, comfort and durability. Designed to help safety managers ensure that workers are wearing the right protection for their level of cut injury risk, the new Vertigo Check & Go gloves are reinforced with Honeywell’s innovative Spectra® fibre, one of the world’s strongest and lightest manmade fibres, commonly used in high strength fishing lines and bullet resistant body armours. 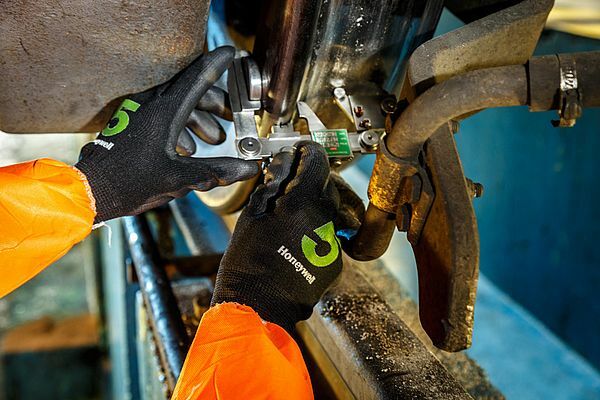 The range includes the new Spectra® black Vertigo glove, which has been introduced specifically for dirty environments and meets a growing demand for a dark-fibre glove with cut resistance levels 3 and 5, which meets industry standard EN388 measures of abrasion, cut, tear and puncture performance. The Vertigo Check & Go gloves cut resistant range also is available white fibre as well as with polyurethane (dry environment) and nitrile (wet and greasy environment) coating and in long and short versions.